mature, confident, and thoughtful men of tomorrow. 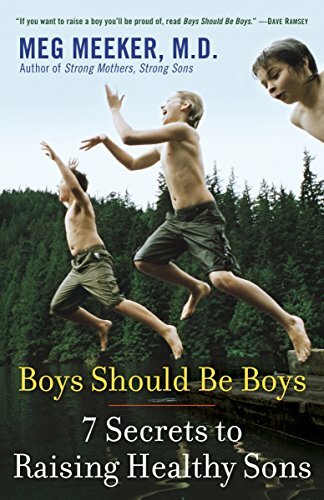 Boys will always be boys–rambunctious, adventurous, and curious, climbing trees, building forts, playing tackle football, and pushing their growing bodies to the limit as part of the rite of passage into manhood. But today our sons face an increasingly hostile world that doesn’t value the high-spirited, magical nature of boys. In a collective call to let our boys be boys, Dr. Meg Meeker explores the secrets to boyhood, including• why rules and boundaries are crucial–and why boys feel lost without them• how the outdoors is still the best playground, offering the sense of adventure that only Mother Nature can provide• the essential ways to preserve a boy’s innocence (and help him grow up)• the pitfalls moms and dads face when talking to their sons• why moody and rebellious boys are not normal–and how to address such behavior• how and when the “big” questions in life should be discussed: why he is here, what his purpose is, and why he is importantParents are blessed with intuition and heart, but raising sons is a daunting responsibility. This uplifting guide makes the job a little easier.